Airports are a microcosm of modern life—a melting pot of stress with potential for moments of exhilaration or boredom. They can be the backdrop to overly long work days or the scenes of tearful reunions and goodbyes. As designers, how do we create the environment for this richly-lived experience? 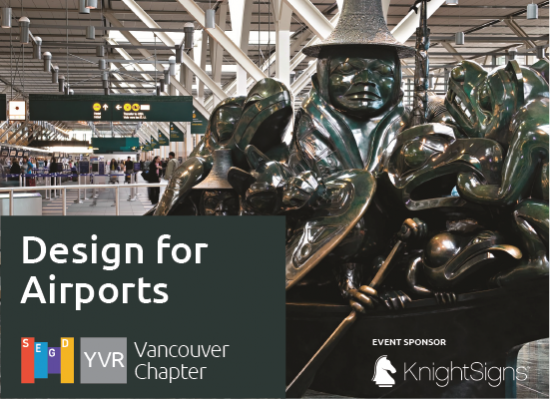 Join SEGD Vancouver in exploring this and other questions at YVR. Winner of the Skytrax Best Airport in North America award for a record breaking 9 years in a row, Vancouver International Airport (YVR) is known for delivering exceptional customer experiences. Led by Nancy Stern, Architect, and Farzeen Mawji, Wayfinding Analyst, this tour of YVR provides an in-depth look at the architectural, wayfinding and artistic design elements that make YVR the airport it is today. Design challenges to consider include ways of creating customer experience, meeting wayfinding and security challenges and capturing peoples’ imaginations with a sense of arrival in this unique and beautiful part of the world. How does an airport design for those who are running to catch flights, and those for all the time in the world? How is YVR balancing the need to promote commercial tenants with competing brands? Or to balance generic wayfinding with placemaking? How does YVR ensure the most inclusive experience possible? This 90 minute, small-group tour, begins at the Bill Reid Jade Canoe and ends at the Fairmont Vancouver Airport Hotel with a catered social hour. Meet friends and colleagues and continue the discussion on the unique blend of architecture, interior design and experiential graphic design that makes up the SEGD community. Ms Stern has been the in-house architect for Vancouver International Airport (YVR) since 1995. In this capacity, she has directed the planning, architecture and design for capital projects in the international and domestic terminals. She also reviews all tenant permit submissions within the airport and commercial developments on Sea Island where YVR is located. She is well-versed in presenting the unique and award-winning projects at YVR. Her spare time is spent with her family, playing tennis, skiing or painting landscapes. She enjoys travel, but her family complains that she takes too long taking photos of other airports. Farzeen has held various positions at the Vancouver Airport Authority since 2015 including Customer Relations and his current role of Wayfinding Analyst. With a degree in Interior Design, prior to joining the Airport Authority, Farzeen worked in Commercial Interior Design and Marketing. Farzeen’s background in design and marketing shape the way in which he understands and articulates passenger wayfinding at the airport - seeing wayfinding as a system that works with the architecture and sense of place that YVR prides itself on. In his spare time, Farzeen loves to travel, shop and bake. One of Canada's leading fabricators of signage solutions for airports, retail, healthcare, commercial and civic clients, Knight Signs is based in Vancouver, Calgary and Toronto. They have designed, produced, engineered and delivered signage solutions for clients in every business, industry and public sector since Knight Signs opened for business in 1968. Knight Signs with over 90 employees is headquartered in 65,000 sq ft state of the art facility in Vancouver. JOIN US FOR HAPPY HOUR AND LIVELY DISCUSSION around the impact of wayfinding, signage and iconography in built environments. What's accessible mean? How do we integrate multiple languages, genders, abilities and cultures? What are the implications of place-naming in the age of reconciliation? Our expert panel, including the planner, the landscape architect, the designer, and the fabricator will pick apart the impact of wayfinding on culture. 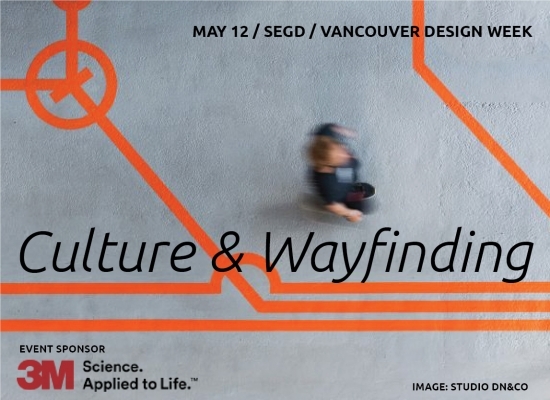 Their work ranges from the creation of the influential Legible London wayfinding program to the implementation of the City of Vancouver's own wayfinding system. Drinks, snacks and rapid fire presentations will be followed by lively discussion on the highlights of wayfinding today with as much audience participation as we can handle. Adrian Bell is a transportation planner and public policy maker with over two decades of experience in wayfinding consultancy including his role at Transport for London and the development of the seminal Legible London wayfinding system. More recently he has worked with Translink, Applied Wayfinding and is now Principal of Activate Planning. Daniela Pilossof, PUBLIC: Architecture + Communication specializes in design for interpretation, brand integration, wayfinding, and the enhancement of an individual’s experience within the built environment with experience working on projects for cities, developers, universities and Vancouver Aquarium. Dolores Altin, is a landscape designer and professional planner with the City of Vancouver. Her approach to place making is based on this human experience and relationship to walkability in the City. Roland House, is a signage and wayfinding specialist working at Knight Signs, one of Canada's leading fabricators of signage systems for retail, healthcare, commercial and civic clients. 3M Canada Company Based on 3M’s tradition of innovation and technological know-how, 3M Architectural Markets offers flexible, creative and technologically-advanced surface finishing solutions for architecture and interior design. With a wide range of architectural finishes and decorative window glass finishes. 3M Architectural Markets helps designers create a complete mood or atmosphere, defining specific character of any environment. The division’s technologies are engineered to create design excellence, enhance human comfort and respect environmental sustainability, globally. SEGD (Society for Experiential Graphic Design) is a global association of people who create content-rich, emotionally compelling, experiential spaces for a wide range of environments, from hospitals and transit hubs to museums and educational campuses. Our work creates a sense of place, helps people find their way, communicates important information and fuels a dialogue between users and the spaces they inhabit. We develop static and digital wayfinding systems, signage, environmental graphics, exhibition content, multimedia installations, public art, user interfaces and branded/corporate environments. We research, plan, design and build a diverse range of visual communications and information systems for the built environment. 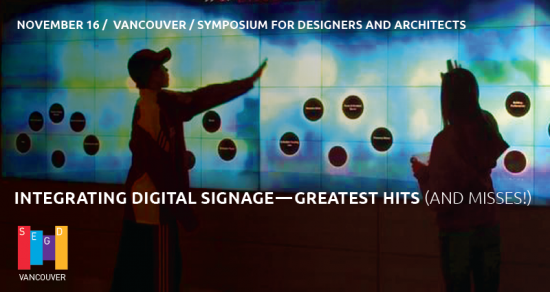 JOIN AN INTERACTIVE SYMPOSIUM exploring the integration of digital media into branded environments, signage, interior design and architecture, brought to you by your local SEGD – Society for Experiential Graphic Design, Vancouver Chapter and SenovvA. Interactivity and digital media are an integral part of almost every innovative project, whether it be a branding campaign, a stylish restaurant interior, an airport terminal or the Superbowl Halftime Show. Staying current and inspired, with a finger on the digital media pulse, is one great way to create imaginative immersive environments. During the course of the evening we will examine how digital media can be a constructive (and destructive) part of your Experiential Design palette, and how it can be used to create inspiring, content-driven experiences, in corporate settings, retail, interpretive displays and entertainment. WHAT: Appetizers, refreshments and an interactive “mini charrette" evening, full of hands-on learning on how to deliver a client-valuable experience, rather than a digital “White Elephant”. WHO: The digital magicians from SenovvA, P. Michael Anderson and Dave Crainford, will lead guests through “the quagmire” of managing design and building teams for a typical digitally integrated feature. Arrive early to grab a drink and snack! FREE. DRINKS AND LIGHT REFRESHMENTS. SPACE IS LIMITED. PLEASE REGISTER FOR YOUR FREE TICKET BEFORE OCTOBER 6. Please join members of the Vancouver design community for a “behind the scenes” guided tour of the new Adler University downtown Vancouver campus. 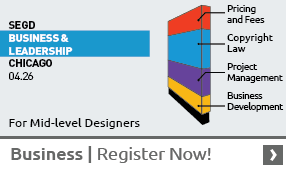 Experience the process and results of integrating architecture, interior design and communication design to create a brand-expressive higher educational environment. Susan Mavor and Brian Wakelin, Principals of PUBLIC: Architecture + Communication will share stories from the design trenches in creating a new campus for this private institution focussed on Masters' programs in social psychology. Meet in the Seymour Street lobby level and tour the five floors of the school to hear about creating exterior campus presence within an interior design project. Find out about the challenges of making significant architectural moves in a building where they're already pouring concrete. Comment on the use of environmental graphic design to express mission, vision and values. Go to EventBrite to register.